Join WeAllSew for Amanda Murphy’s Modern Holiday Blog Tour and Book Give-Away! Welcome to Day 6 of Amanda Murphy’s Modern Holiday blog tour! 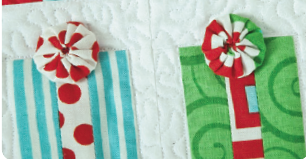 We’re thrilled to have Amanda as a BERNINA Sewing Celebrity and delighted to be part of her Modern Holiday blog tour and book give-away! And we usually have a fair amount snow here in the Blue Ridge Mountains of western NC. But… we haven’t had snow in two years! So you can understand why, after two highly unusual snow-less winters here in NC, it’s been a while since I really got into the holiday spirit before the holidays actually arrived. 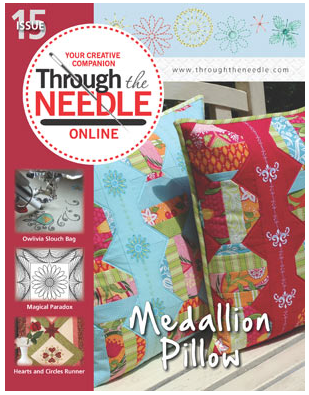 If you’re a regular reader of BERNINA’s Through the Needle ONLINE magazine, you’ve seen bits and pieces of my home – a sweet little 1925 cottage in the woods – where I do some of the photography for the magazine and WeAllSew. 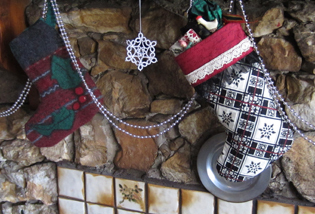 This photo of Lisa Klingbeil’s Quilted Holiday Stocking includes some of my favorite decorations – snowflakes crocheted by my late Aunt Thelma – hanging from the mantle of my stone fireplace. 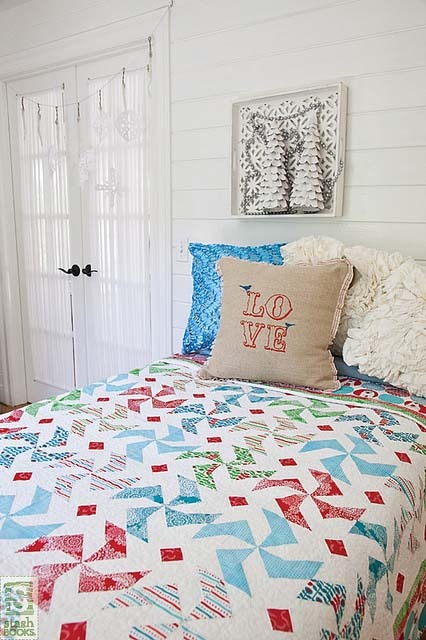 And in Tuesday’s post you saw my Scrappy Plaid Quilt (and my mountain-bred Plott hound), so you know how happily Amanda’s Snowflake pillows will fit into my rustic retro décor. 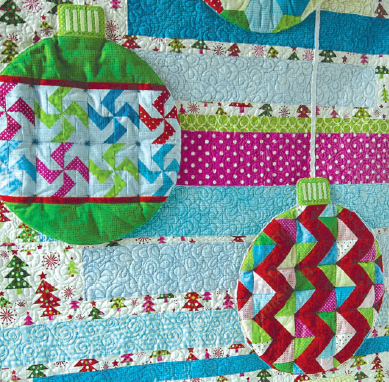 Those leftover plaid shirt pieces are perfect for the patchwork. Another favorite is Amanda’s Snowfall Quilt, which evokes memories of wintry schooldays spent staring out at the snow, wondering if we’d get to go home early. 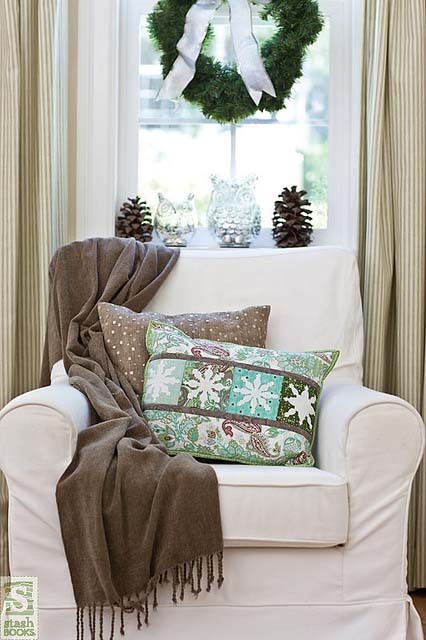 A warm and cozy way to ensure we’ll have a “blanket of snow” for the holidays, regardless of whether the weather cooperates! 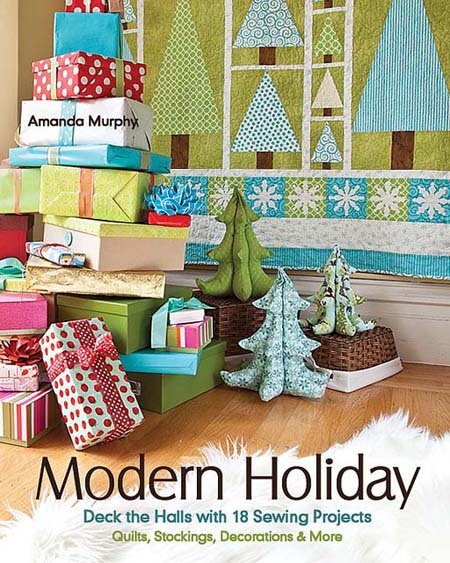 Modern Holiday is also full of projects featuring trees, ornaments, and stockings as well as fun 3-D techniques and embellishments. How can you get a your very own copy of Modern Holiday? Visit your local quilt shop, bookstore, or online bookseller, or… be one of the lucky winners of Amanda’s Modern Holiday Give-Away (hard copy for U.S.A winners; e-book for international winners). To enter for a chance to win, leave a comment below about your favorite snow-related memory or project. Not only will you be entered in our contest; you’ll also help keep me in the holiday spirit! A winner will be selected on 7/24/13. Be sure to check out the other stops on the Modern Holiday Blog Tour for more stories and more chances to win! Previous Previous post: We Celebrate Our Loyal Fans! Many many years ago, we were stationed in Japan (I’m an Army brat). The winter snows were really deep. One year instead of making a snowman, we (or I should say my Dad) made a snow bear. He also used to take us skiing (more like ski walking) back up into the hills behind the base. Thanks for sharing the lovely pics from the book & the chance to win. I have never seen snow so I have never had a white Christmas. But I think that a white Christmas would be wonderful so I am hoping that you get a really White Christmas – but a safe one too. I love making snowflakes out of paper to decorate the windows with my children though, so I might have to try it with fabric this year. I have to say we have more ice than snow. But about 6 years ago we had a major storm that left everyone here with no electricity for about 2 weeks. My husband was on tube feedings and i had to take him out of town after 4 days so he could continue his feeding. what a storm. I know the grand children enjoyed all the sledding. We live in southern Indiana so we only average 7 inches of snow each winter. If there is even a hint of snow in the forecast everyone runs out and buys egg, milk, and bread. I am from northern Ohio so I think this just so funny! I secretly enjoy the mild winters even though my children don’t have the memories of ice-skating on frozen creeks and building many snowmen. My favorite snow memory is of spending hours sledding down the hills, then running in the kitchen for a cup of hot chocolate complete with marshmallows. There’s nothing more delicious than melting marshmallows – yum! Thanks for the chance to win this inspiring book! I loved sledding on the hill beside our house. The goal was to go so far that you’d fall in the creek. Growing up in a family of 7 children was always more challenging in the winter. Big snw drifts, loss of power, my parents always struggling to find a place for us to be so that we would be warm. My favorite was Mrs. Sipes house. She always had a needle and thread handy with projects galore to keep us busy. I love winter! I can’t imagine winters without snow… although if you ask me again in January I might wish for it! 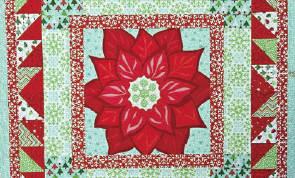 Congratulations to Amanda, I bet that Christmas Countdown Quilt is pretty amazing! Looking forward to picking up a copy soon. I live in the Sonoran Desert. Christmas never has snow here. Our memories include waking up to crisp, cool sunny mornings and enjoying family and friends. I love the snow and I guess I’m not suppose to as I am a ‘senior’ citizen. When I was growing up in TX, I would see all the pictures of Santa, Christmas & snow. Now I am in MI and I love it. I love all the fabric and the projects!!!! Wonderful!!!! My favorite Christmas fun is when there is snow for Christmas morning!!!! Always love a white Christmas as a child…as a mom and now as a grandmother!!!! Thanks for the wonderful give away!!!! My favorite snow memory was also the first time I saw snow. I was very young, probably before my fifth birthday. My parents were driving somewhere and I saw the snow at the side of the road. It was so white and smooth. It looked so inviting. I tried to persuade my Dad to stop the truck so I could run in the snow – not just that but I wanted to do it without shoes! I can remember my parents “discussing” whether I would be allowed to do this. In the end I did. Somewhere there is a photo of the 3 or 4 steps I made in the snow – but it’s etched in my memory. Thanks for putting my name in the hat for the drawing! As a child my entire family, mom and dad included, would go to a local forest preserve each winter where they had a great golf course. On the 18th hole of that course was a huge hill that was opened up every winter for sledding. We all would go multiple times each winter and sled for hours and then go home where Mom would make us all homemade hot chocolate and serve homemade cookies she’d made the day before. Those are the kind of memories I tried to give to my own children because family is such an important thing in anyone’s life. I just love all of Amanda’s patterns. Each time she releases a new one I just know it will be another one I will want, even before seeing it. This book I am excited to see as I’m sure it’s packed full of many more I will love. My favorite snow memory is the two-year period when we lived in Colorado as a child. I remember driving at night to square dancing with the snow swirling against the windshield against the black sky, with my dad or mom driving. We returned to Texas after that so I don’t see much snow. But a nice memory of childhood and my late parents. I have lived in Wisconsin all my life, and hoped one day to move some where warm. Then I met a man who moved to Wisconsin for the snow and I married him! Don’t like the snow but I do like to decorate with snowflakes. Go figure! Thanks for the give away! My favorite memory is being all snug at home when at least a foot of snow was predicted. As it snowed I baked bread and made steak soup for dinner. The house was filled with wonderful smells and it was getting dark. When we sat down to dinner we watched the snow swirling as it fell past the yard light. It was so quiet and magical and it felt like all was right with the world. I have always lived in the desert and I only remember it snowing once. We all went outside with socks for gloves and had to scrape all the cars in the neighborhood to make a small snowman. We loved it! My mother who grew up in Idaho…just laughed at us. My first year in nursing I had to work on Christmas day and we had a huge storm and nothing was moving so all the students in the residence had to go make breakfast for the patients in the hospital , we had so much fun singing carols to them and trying to make their day special . As a child, saw first snow with sun shining – looked like diamonds shining. I love Christmas, snow, and all the wonderful feelings during the holiday season. 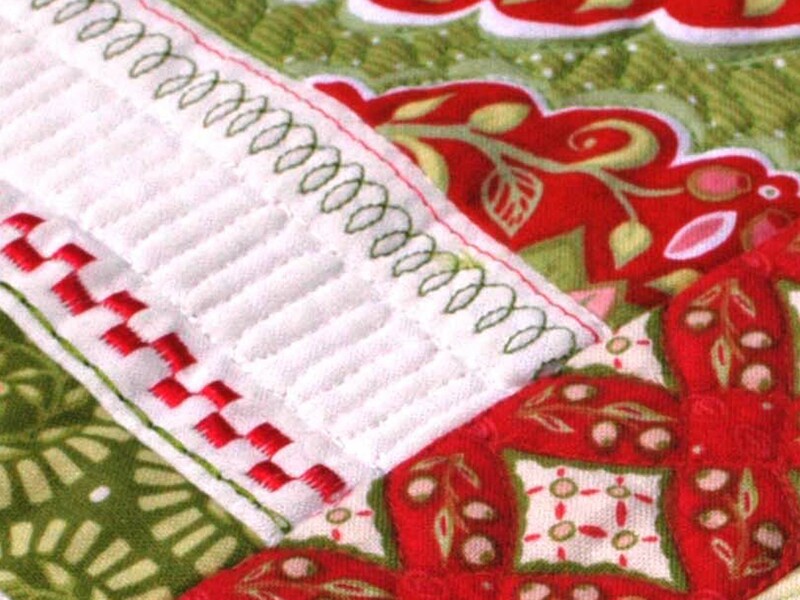 My favorite memory is quilting for family and friends during December by the fire. Many snow memories… ice skating and sledding, but a favorite was when my parents were out of town at a relatives’s funeral, and we had an ice storm. My big brothers kept the fire going all night and all 5 of us slept in front of the fire. They were my heroes! My first snow–it was in Louisiana!!! We got dressed up in the warmest clothes we had, and had a ball! Now I live in Montana, and I see WAY too much of it. I do still love when we have “diamond” snow–the kind that glitters in the sun. My favorite is a childhood memory. My four siblings and I would anxiously await Christmas morning, not just because we were expecting presents but also because we couldn’t wait to see the tree! In our family, Santa Claus decorated the tree. My Mom would stay up to wrap presents while my dad decorated the tree. We nver saw it until Christmas morning. I wish I had been able to do this with my children. Unfortunately with both of us working full time, there just wasn’t time or energy to wait until after bed time on Christmas Eve to decorate. I will never forget seeing the tree for the first time or the magical way it felt. I love snowflakes for Christmas because they can extend for decorating into the winter. Living in MI, the snow is always apart of winter fun. 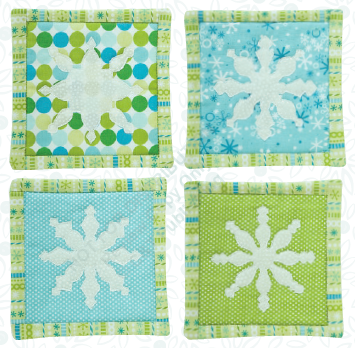 Snowflakes on quilts and table runners are great! I would love to try some of the projects in this book. They are wonderful! Thanks for the chance to win. My favorite memory is when my brother just bought a Jeep and he came to visit. The ground was covered with snow and it was nighttime. We went for a ride in his open Jeep in a large open field. It was magical, so quiet with the snow looking like it was scattered with crystals with the moonlight bright. One year we were snowed in here in rural Oregon. We had Christmas Eve dinner at our neighbor’s home and then walked back through our snow-filled field, led by the lights from our house on the hill. It was absolutely magical and I don’t think I’ll ever forget it. We had a huge snow (about 38 inches!!!) while stationed at Fort Monmouth, NJ. 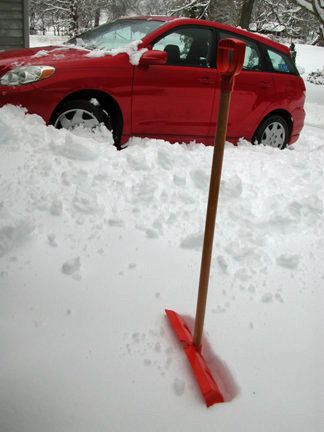 All military families were responsible for shoveling the snow from the sidewalks near the quarters and we all did. After that was done, I bundled up my little fellow to go exploring. When the door, he shot out of there like a rocket and (since he was shorter than the snow banks) it was like he was in a maze. I was terrified that I would lose him, but he slowed down… eventually. Amanda’s book looks fantastic! I’m loving the 3-D embellishments she’s used. Growing up we played in the snow every chance we got. Loved the blizzards that would pack the snow into drifts and we’d dig a hole into them and make a house or a fort. Lovely memories. I moved south to get away from cold snowy weather but I love to decorate for Christmas. 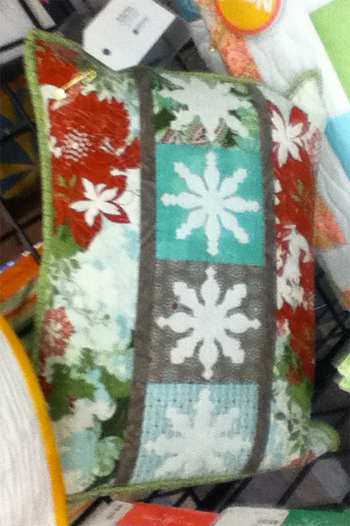 Would love to make the snowflake pillow. Growing up in Los Angeles we never had snow. We don’t get snow where I live now either except that we occasionally can see snow on the nearby mountains during the winter. I love seeing all the beautiful items in Amanda’s book. 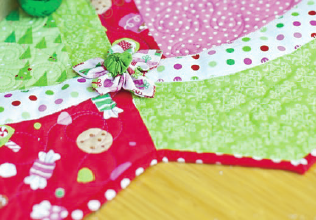 I would love to make the cover quilt as well as about 20 other things, hehe. I grew up in Alaska on 40 acres away from any big towns. We always had snow for the holidays. I remember one year it snowed for days and days and we were snowed in for nine days! We had the National Guard come to our house in a tank like vehicle to check on us and make sure we were ok. It was exciting and fun. Thank you and Amanda for a super giveaway and a chance to win. My favorite snow memory is when we received about three feet of snow one winter. We live on the Pacific Coast and rarely get snow that sticks. But this year was an exception. My kids would jump on the trampoline and “fall off” into the snow. We couldn’t go anywhere because the snow was higher than the bumper of our truck and we had too much snow to shovel (12 acres). The power was out for four days straight, so to keep us all occupied, we played games. We had no running water since we are on a well so we improvised by using the hot tub water to flush toilets. We used the barbeque to cook our meals. It felt like we were back to the “good old days”. We were awfully glad though when the power came back on. How spoiled we all are and how we take all our conveniences for granted. Thanks for the chance to win Amanda’s book. I will never forget the big snowfall we had over 40 years ago. Two days after the snow my sister, friends and me took a walk to town to check things out. No cars were on the roads yet because all of the streets weren’t plowed. We had a blast. Michigan snow day memories – school closed and building snow forts w/ my brothers and our neighborhood friends. Fun times! 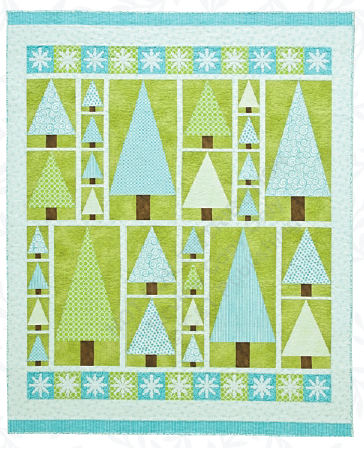 I love the Holiday Forrest quilt in Amanda’s book! Thank you for the giveaway! When I was in grade school we had over three feet of snow. I remember walking out the door and the snow drift was almost bigger than I was. I’m now in my 50s and we’ve still never had anywhere near that much snow again. Growing up & living in Phoenix we had no snow, but my mom always decorated like crazy for Christmas !!! Making gingerbread houses with mom & her grandchildren is the best Christmas memory. I hope to start this new tradition with my first grandchild- due in August!!! When I lived in northern Florida, I remember the year it snowed. My children were able to go out and build mini snowmen, there wasn’t enough snow for a regular sized snowman. Thanks for the chance to win a copy of Amanda’s book. The projects look great. My favorite memory was many years ago as a teenager waliking to Midnight Mass and as I got closer the bells from the church could be heard playing christmas Songs and it was snowing at the time. Beautiful. My best memory of snow was the train scape under out Christmas tree. My parents did this amazing job of decorating our tree after we went to bed on Christmas Eve and we hadn’t even seen a tree up to this point so it was all very magical. We thought Santa decorated out tree and the train scene had buildings, a church that played silent night and everything else the perfect Norma Rockwell scene would have in it. But the best part was the ice skating pond! A piece of glass mirror surrounded by snow with skaters to give you the illusion of people ice skating on a pond! I grew up in the NE and back then it was usually cold enough to ice skate on Thanksgiving, so we did a lot of it! My favorite snow related memories are from the year of the “great Snow” – Our children were small and we were snowed in with huge drifts. It was so cold that I hung quilts over our windows to help keep the house warm at night. The boys played in the snow for days. Our daughter was too small, but I stood her in the snow and took a few quick pictures. for her memories. We don’t get huge snows like that very often, here in the middle of Arkansas, and it usually only lasts a day or two at most. PS> I LOVE LOVE this preview pics from this book! 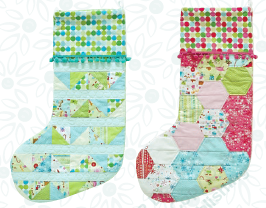 And it’s being released at just the right time for Holiday sewing! very nice pictures. I’d like to get a copy of our book. We do not receive much snow where I live so, when it did snow when I was young, it was an exciting event. Lots of snowball fights and building snowmen. Thanks for the chance to win Amanda’s amazing book. Fingers crossed! Skiing in Park City, Utah… Oh what fun what fun!! When I was about 8, we got 5 feet of snow one year. I’ll never forget it. A guy who lived down the street drove a snow plow and he took all the snow from the street and put it on the corner of our yard. We had a mountain of snow! We slid down the mountain all day for weeks. Greatest winter ever! My favorite snow story was when we traveled from Pensacola, Fl to visit my husband’s family in MO to show our 2 year old snow and we didn’t have snow in MO but got snowed in in Jackson, MS on the way home and found out it had snowed in Pensacola while we were gone! My kids have taken up cross country skiing which I love and now we can ski together! One of my favorite memories is building a giant baseball-playing snowman with my dad and my brother. He was taller than my dad, wore a Cincinnati Reds cap, and held a Louisville Slugger. He was the traditional snowman shape. I was 4 and my brother was 2. I am now 50 and have the photo of the 4 of us to document this great memory. Favourite snow memory was about 3 years ago being snowed in (very unusual for Wales) and playing in it with 3 very small kids who had never seen so much snow and were sooooo excited! My favorite snow story is when my 6 brothers and sisters were young – There was a week in January where we accumulated so much snow in Massachusetts we were able to build snow tunnels in our back yard and play outside in the cold for hours! This gave my poor tired Mom some relief from her noisy “brood” as she called us. Great memories! I loved snow days when my friends and I would get to pull out our sleds and fly down the hill in front of our house. I loved to go sledding as a child. When we were thoroughly frozen, we would go to into the house to get warmed up with hot chocolate. Storm came at Halloween time lost power for some time. Only good thing that happened was my granddaughter was born on Halloween. Don’t mind the snow as long as I am home. Probably the winter that it snowed so much that my sister and I were able to make snow caves in the piles next to the driveway. My favorite snow memory is being stuck in Portland, OR ‘s first big snowfall in 100 years a few years back. I thought I’d take a quick jaunt up to visit my daughter before she left for her in-laws for Christmas. It began to snow but she told me it never snows in Portland and if it does it melts. Well, once the snow was up past the car windows we knew I may be stuck for a while :-). The city was closed down the week of Christmas because they didn’t have enough snow plows so we trudged through the snow to get groceries. I made it back to SoCal the day before Christmas! I love the snow, but live in Northern California and have to travel to see it. We did when I was a child to Denver to see my grandparents for Christmas. Such fond memories!